Investing is one of those things that just about everyone knows they should be doing, but don’t seem to get around to it. After speaking with several potential investors, I’ve come to the conclusion that one of the biggest things holding people back from getting started is figuring out which online broker to use. The bottom line is that while investing is something everyone should be doing, it’s also something that not many people know much about. Nonetheless, you shouldn’t let something so small stop you from investing. 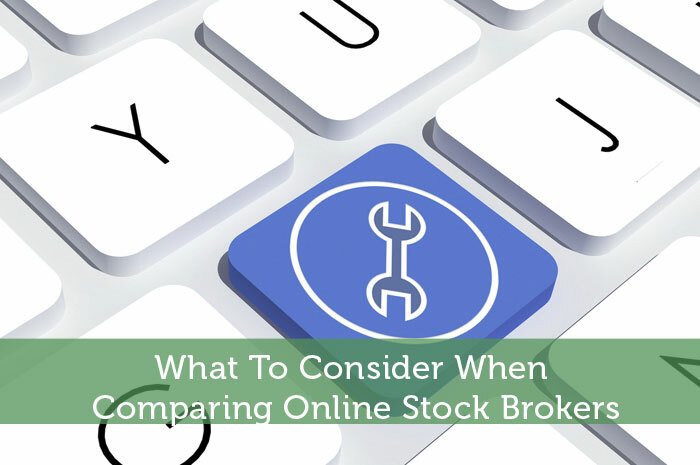 So today, I’ll let you in on a few things to look at as you compare online brokers. By making sure to pay attention to these factors, the broker you choose will likely be the best broker for you! We all know the saying, “It takes money to make money”. That’s a saying that’s true in just about any industry; however, it never quite rings as true as it does in investing. In the world of investing, you need money not only to invest, but to pay fees associated with investing. However, as with any other business model, the fees associated with the service can vary widely from provider to provider. So, before you start working with any specific broker, it’s a good idea to compare the trading fees associated with the brokers you’re interested in. Another major factor that seems to hold many people back from investing is minimum deposits. The bottom line is that most brokers you find will require a minimum deposit to get started; and many people don’t have thousands of dollars to dump into the stock market at the beginning. Nonetheless, there are several brokers out there that offer incredibly low minimum deposits; and some like TradeKing, TD Ameritrade, and Options House. So, if you don’t have a ton of money to get started with, don’t let that stop you. Instead, start a search for brokers that offer no or low minimum deposits! Online reviews are incredibly important when deciding to work with any financial institution. The reality is that when you make the decision to work with an online broker, a bank, or even a credit card company, you’re not just making a decision to open an account; you’re making the decision to start a relationship with that company. Keeping that in mind, reviews can tell you about the experiences others have had when working with the company. If a large amount of other people have had a bad experience, chances are that you will too. So, look for reviews that include positive notes about customer service, guidance, and payout! Finally, when you are finished comparing the factors above, you’ll probably have a decent list of brokers to choose from. Now, to decide which of the brokers on the list you’ll be working with, take a look at the promotions offered by the broker. Often times, online brokers will be willing to match your initial deposit, offer fee free trades, and more for new accounts. So, this is a great way to break a tie! It’s unfortunate that the broker comparison process holds so many people back from investing. Nonetheless, it doesn’t have to hold you back. Using the guide above, you should be able to find the perfect broker for you. If you have any questions, please feel free to ask in the comments below. Otherwise, happy trading my friends. Great post. I found it very useful as it has enlightened me on a business perspective because brokers offer varying terms and conditions some of which are favourable and others not. If i put the above factors into consideration when choosing a broker therefore i will definately end up choosing the one who offers the best bargain.